Cavities can lead to pain, tooth breakdown and tooth loss. If a cavity is left to grow for too long, it is possible that the infection can spread and cause life-threatening consequences. 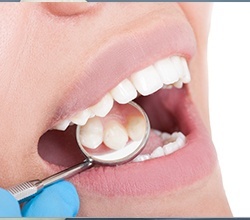 When a cavity is detected, we remove the infected part of the tooth and restore it with a composite or tooth colored filling to fill in the removed or damaged part of the tooth. This restores your tooth to its original form and function and helps to keep your bite strong and functional for years. Our biocompatible fillings are made to match your tooth color and keep your teeth looking natural. This way, you get a functional solution with a cosmetic bonus!